One of my favorite “breads” is socca. It’s a flat cake made out of chickpea flour. Well, I took that same idea and applied it to PIZZA! Of course! Instead of sprouted chickpea flour, which I use to make the socca, I used sprouted lentil flour, which is an amazing source of fiber, protein, and iron, and so easy to use. This pizza comes together so quickly. For the crust, scoop flour into a bowl and begin adding warm water until the batter becomes similar to pancake batter: thick, but easy to pour. The amount of flour and water you use will depend on your skillet size and how thick you want your crust. I seasoned the batter with a splash of raw apple cider vinegar, dried oregano, paprika, and pink Himalayan sea salt. Use whatever seasonings you like! Cover a skillet, I use a cast iron skillet, very well with coconut oil. Turn on medium-high heat. Pour the batter into the skillet so that it evenly covers and cover with a lid. Turn on medium-low and let cook for 5-10 minutes until it is cooked through. 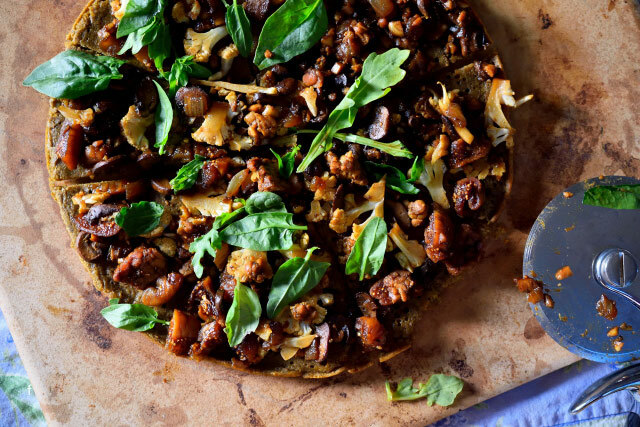 If you want to get a slight crust on the top, you can flip over for a few minutes, just make sure you put a little coconut oil down if you're not using a non-stick skillet. Flip back over and top with your toppings. 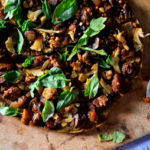 In this particular pizza, I topped with caramelized onions, mushrooms, tempeh, cauliflower, and dried figs which were seasoned with Himalayan sea salt, coconut aminos, and kelp flakes. I added some fresh basil, spinach, and arugula.